The Royal Nova Scotia International Tattoo is a show inspired by Military Tattoos given by military bands and display teams. 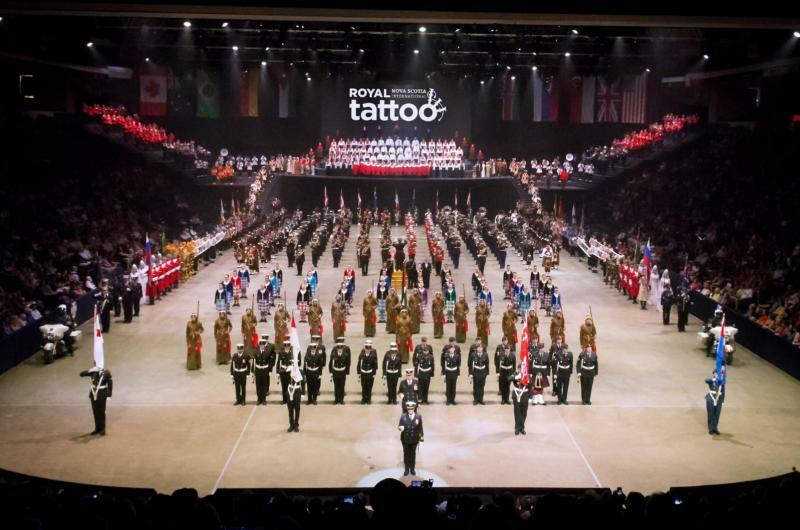 The Royal Nova Scotia International Tattoo is unique among other Tattoos in the world in that it is more theatrical in nature with a mixture of both military and civilian performers. It takes place in the Halifax Metro Centre’s hockey arena, a venue that, to some degree, resembles a traditional theatre in the round. The show is heavily costumed and intensively rehearsed with technical staff, choreographers, assistant directors, wardrobe staff and designers as part of the production team, which also sets it apart from traditional Tattoos. This spectacle is one of the highlights of a Nova Scotia summer. Travac’s visit to the Tattoo includes round trip airfare from Ottawa to Halifax, 4 nights’ accommodation at the Halifax Marriott Harbourfront, a tour of Halifax including visits to Lunenburg, Chester and Peggy’s Cove, Reserved seating at the Royal International Tattoo, free time in Halifax and the services of a Travac Tours Director. Space is limed to 15 couples. This morning you will depart for Halifax. Upon your arrival in Halifax you will be transferred to your hotel. The balance of your day will be free to explore Halifax on your own. From your hotel it is an easy walk to some of the fine restaurants and shops that are in the area. Today is your day to enjoy The Royal Nova Scotia International Tattoo. Over the years, the show has been seen by well over 2,000,000 spectators and has hosted tens of thousands of performers from 21 countries. In terms of annual economic impact, it generates tens of millions for the province of Nova Scotia and the Halifax Regional Municipality. Indeed, it will be a most enjoyable day. Your day will begin with a professionally guided tour of Halifax. Attractions in Halifax are plentiful! From iconic lighthouses to urban gardens, stunning galleries and museums and a waterfront science centre. Continuing the tour, you’ll move on to Chester, Lunenburg and finally Peggy’s Cove. The village of Chester, situated on a peninsula halfway along the coast of Mahone Bay, is one of the most picturesque communities anywhere in the Maritimes. Lunenburg, a UNESCO World Heritage Site – with its narrow streets and unique architecture – is also the home port of Nova Scotia’s sailing ambassador, the Bluenose II. This graceful ship is a replica of the original fishing boat. Your final stop, before heading back to Halifax, will be Peggy’s Cove. Famous for its lighthouse, Peggy’s Cove is one of the most iconic images in Eastern Canada. Your day is completely free to wander among the many sites that attract people to Halifax. Your tour director will have plenty of ideas on how to spend your day. After a most enjoyable experience in Halifax, you’ll make your way back to Ottawa. Your tour director will advise you on your departure time from the hotel. Tipping is included for luggage handling. Most bus tours often recommend that each person tip their Travac Tour Director $5 per person per day, coach driver $3 per person per day and the local guides $3 for half-day tours. While we at Travac do not stress a tipping policy, any gratuities provided are greatly appreciated. Double occupancy: $1919.87 per person ($1699 per person based on double occupancy + HST of $220.87). Early Booking Bonus included! Please add $100 per person for bookings made after April 26, 2019.